Larry was elected to two terms as Superintendent of Fresno County Schools and served 43 years in education. He was responsible for the fiscal oversight and technical support for 35 School District and over 200,000 students. He loves inspiring students and families. He is very active in community and civic groups as well as many professional organizations. 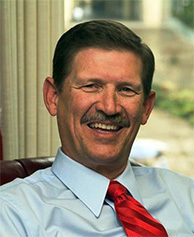 Larry has served on 12 non-profit boards and serves as a Member of the Board of Trustees for Fresno Pacific University. In addition, he is on numerous advisory boards for California State University, Fresno. He served two years as the Chair of California’s Fiscal Crisis Management Assistance Team (FCMAT) during the height of the fiscal crisis in California. Larry has served as a member of the State Board of Directors for the Association of California School Administrators (ACSA) and was a member of the California County Superintendents Educational Services Association (CCSESA). He is a member of the National Advisory Board for Rachel’s Challenge, the premier anti-bullying program in America. He has won many awards including the 2003 Superintendent of the Year for ACSA Region 9. One of his favorite awards came from California State University, Fresno in 2007 when he was named “Top Dog” as an Outstanding Alumni of the University, Kremen School of Education and Human Development. In 2010, he received the Distinguished Citizen Award by the Sequoia Council of the Boy Scouts. In 2011, he won the Horizon Award for his work in promoting “The Arts.” California County Superintendents nominated Larry for the Justus A. Prentice Executive Leadership Award for California for 2011. He was also selected as one of twenty Americans of the Year by Esquire Magazine for 2011 and appeared in the December 2011 Issue. In 2012, he was honored as “Humanitarian of the Year” by the Big Fresno Fair. Larry and Dot operate C323 The Powell Project, an effort to bring encouragement and hope to families and individuals who are struggling in life. Larry is in great demand as a Motivational and Inspirational speaker and has presented thousands of speeches and seminars up and down the San Joaquin Valley, the State of California, and throughout the United States at various school districts, Honor Societies, civic groups, association conventions, service clubs, conferences, Universities, and churches. Struck with Polio at the age of 15 months in 1949, Larry is an inspiration to everyone he meets. He was a champion wrestler and coach, an avid golfer with a 5 handicap, a swimmer and gymnast. His bench press record is 320 pounds when he weighed only 129 pounds. He holds high school records for rope climb (20 foot rope in 1.8 seconds) and pull-ups (44). He strongly believes that the only things you cannot do are the things you do not attempt. Hard work and determination lead to success. His wife, Dot, is the Executive Director of SALTFresno, a non-profit agency which provides mentoring services to students, parents, teachers, administrators, and the community at-large. She is also a writer of Children’s Books and a speaker. Most people have never seen Larry without a smile. Larry has made equity and access a hallmark of his career and works to provide equal opportunity to everyone. He is passionate about “The Arts,” reaching dropouts, Preschool, and Rachel‘s Challenge, a national anti-bullying program. In addition to being the former Fresno County Superintendent of Schools, Larry has a radio feature called ”Good News with Larry Powell“ heard five days a week on iHeart Radio. Larry is a Political Analyst for two local Television Channels 24 and 47. He is a consultant, a minister, motivational speaker, writer, actor, singer, and songwriter. His favorite past-times include: Family, Church, Golf, Music, and Yo-Yos. Larry is affectionately referred to as Reverend Superintendent by his colleagues.